Sam shot? 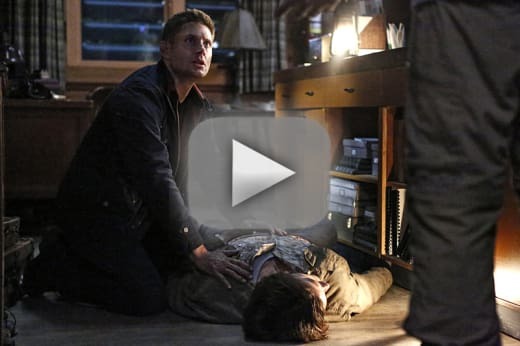 Dean meeting up with a reaper? 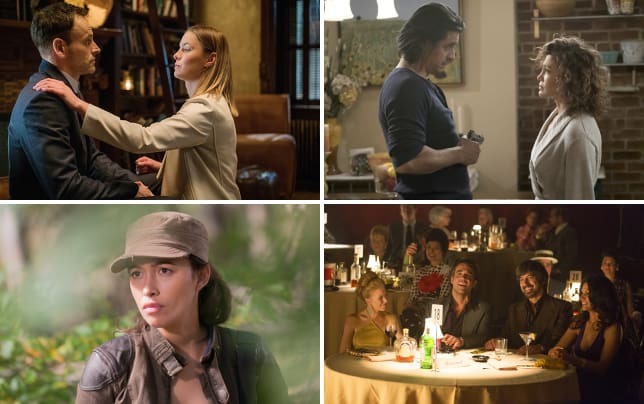 As for now, TV Fanatic staff writers Sean McKenna and Christine Laskodi and The Winchester Family Business’ Alice and Nightsky are ready to talk werewolves, Billie and that ending. So join in the latest Supernatural Round Table to talk “Red Meat”! Alice: It’s more of a shocking and disturbing scene, but I can’t get it out of my head! It left the largest impression. Corbin suffocating Sam until he was “dead.” There was something about Sam looking so bloody and lifeless on that floor that just sucker punched me in the gut. And then Dean comes in and finds Sam that way. Oh, the devastation! I did lose it when Dean leaned over Sam’s body and promised he would come back for him. We’ve seen both these brothers die a lot, and it still gets me every time. Honorable mention was that long, slow swipe across Sam’s body just before he wakes up. Just… Wow. Christine: It's so hard to choose a favorite moment. I really didn't enjoy this episode. But if I HAVE to, I'll say that Jared Padalecki’s acting was on-point. While I thought many things in the hour were sloppy and senseless, Jared's acting wasn't one of them. He did a spectacular job. Nightsky: It’s actually very difficult to pick out a single scene, not only because the entire episode was outstanding, but because it all flowed together so seamlessly. One thing led to another without any break in the emotional suspense. I really felt like I was tense from beginning to end. 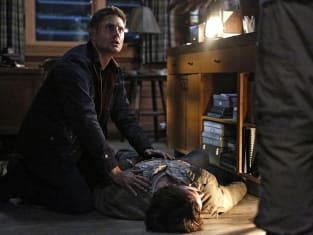 If I must pick a moment though, it was when Dean shook Sam’s lifeless body and said “Sammy?” It was such an instinctive move to try to wake his baby brother when his mind simply wouldn’t allow him to comprehend what had happened. Sean: Yeah… I really didn’t enjoy this episode, but I did like Jensen Ackles and Jared Padalecki’s performances. They definitely committed and you could feel the anguish when Dean thought his brother was dead. And even Sam fighting on while wounded had its moments. I never thought the brothers were in danger, but the acting was on point for sure. What did you think of the werewolf story? Alice: It was one of the better werewolf stories this show ever had. Having said that, it was still OK. There are just some monsters Supernatural hasn’t done well in recent memory, and werewolves are one of them. Christine: If my memory is right, this is the sixth werewolf episode. I agree with Alice. Werewolves aren't one of Supernatural's strong monsters. Additionally, I feel like we've had a lot of monsters of the week lately, and very little Amara or even Casifer. I really would rather have seen one of them tied to Sam's "death" in place of a werewolf. Nightsky: I didn’t care one way or another about it. It was simply backdrop to Sam, Dean and the couple’s trauma and character study. Who cares about the monsters when one man kills and another overdoes on pills for love of the people they can’t live without? Sean: Werewolves are fine, but I didn’t really care. And the guy who was changing into one was a tool, so I was more waiting for Sam and Dean to take him out. It really was just backdrop for the Sam and Dean emotional stuff, though. Should Sam and Dean be worried about Billie's warning about no second chances if they die? Alice: Hell yes. But she said that to Sam during their first meeting in Supernatural Season 11 Episode 2. Nothing has changed. They should continue to be worried. If anything, it was Dean getting the message this time, and I think he needed to hear that. Christine: I want to say yes, in terms of the story, but no, out of realistic expectations. They're the Winchesters. They're never going to die, for real. Unless of course, the writers have a VERY different plan for Season 12. Which, actually, might be interesting! Nightsky: I don’t think worried is the right sentiment. I believe Billie is sincere in her threats, but what can they do about it? They don’t want to die no matter where they end up, but they are rather powerless to alter the outcome other than try very hard to not die! Sean: They should be worried about Billie’s words but not just for themselves. It’s got to involve another character. 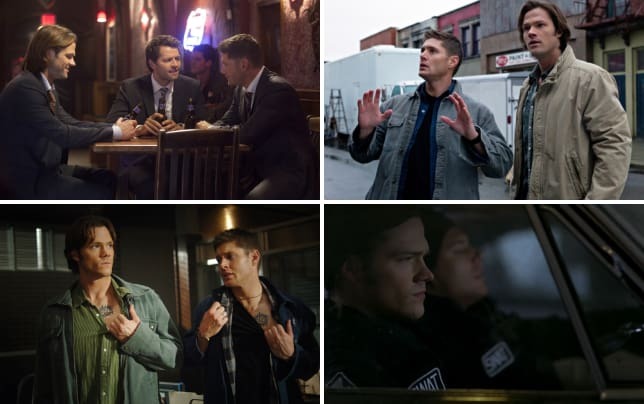 Maybe if this were the final season, I’d say sure, but Sam and Dean are usually in the clear. Something's up, but I just hope there's some solid payoff for it all. Will Billie have a bigger role to play in the battle against the Darkness? Alice: I’m not sure about bigger, but she seemed rather eager to take Dean with her. I’m curious if there’s more than to her than what she says. Is she just a reaper trying to do her job and a little pissed about her boss getting killed, or is “the empty” the key to defeating The Darkness, and she’s trying to pass hints? What is there for Sam and Dean to find? We need more. Christine: I'm definitely on board with the idea of Billie trying to pass hints to the Winchesters. It would certainly make sense that she's going to be a key factor in defeating Amara, since we met them simultaneously. I'd love to see the reapers involved in the fight. Nightsky: The writers have brought to our attention on multiple occasions now that Billie has access to "the empty." She could very well be a part of a plan to open the void at the proper moment so that the brothers can trap Amara (and Lucifer?) in "the empty" for eternity. Sean: She has to. You don't just bring a character like that and not do anything with her. And I agree about those dropped hints. The empty is going to have a part in taking down the Darkness, which by the way, where has she been? Were you glad Dean didn't tell Sam about meeting with Billie? Alice: No, that is not the word, but it rhymes with glad! Come on, have these brothers learned nothing from all those times of lying to each other and it coming back to bite them hard? I like seeing forward motion in my characters, not regression. So yeah, kind of mad about that. Christine: I was sad. And mad. I was smad. (Gilmore Girls quotes follow me everywhere!) Sam and Dean always take two steps forward and twenty steps back. It's just like Amara. He should have told him. He knows he should have told him. But he didn't. Instead he told a joke. He just thought his brother was dead. Shouldn't Dean have given Sam some honesty in that moment? No writer could have come up with words that would make that sound right, but I think an unspoken conversation with looks, hugs, relief and loving understanding was desperately needed. After 45 minutes of gasping, the last five minutes dropped us cold. Sean: It was just a weird way to end things, especially after the brothers have been pretty honest this season. Dean should have just told Sam what was up and dealt with Sam being mad or whatever his response would have been. It just felt like it was taking steps back and an unfortunate way to close out the hour.